The airport of New York resumed its work. Earlier, because of bad weather, over 3 thousand flights were canceled there. 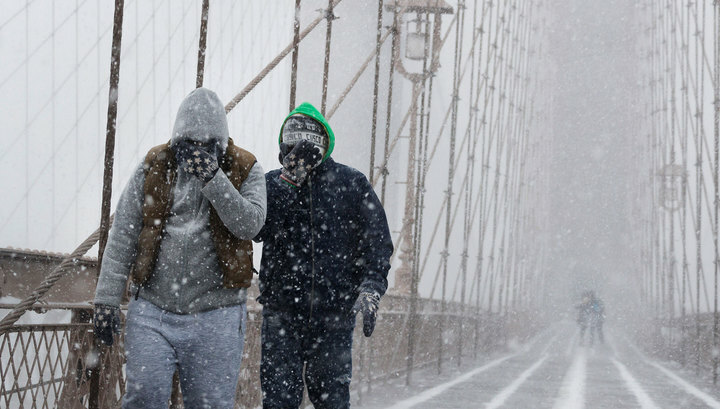 In New York – an abnormally low temperature and snow storms. Hundreds of thousands of Americans were left without electricity, there are also deaths from frostbite. 13 deaths (six people – from frostbite, the rest – as a result of accidents), almost 150 thousand consumers remain without electricity in the US and Canada. The wind, whose speed reached 110 kilometers per hour, cut off power lines. In nine states from South Carolina to New Hampshire, the authorities threw the national guard to the aid of the population. The authorities of the city and the state of New York have introduced an emergency regime. For one day the schools were closed. Overground lines of underground work with irregularities. On the streets came snow-removing equipment, but drivers on summer tires (winter is not put) still stall in snowdrifts. An unprecedented situation in the sky over the largest city of the US recorded the site Flightradar24. Half of the second day, and over the frozen Big Apple – not a single plane. At the three largest airports in the metropolitan area – John F. Kennedy, LaGuardia and Newark – 4 thousand flights were canceled. Tens of thousands of passengers wait for hours to fly. Cold and the middle West is shackled. In Missouri – minus 13, which is 15 degrees below normal for this time of year. In Texas, local authorities are urgently opening shelters for the homeless, who most often become victims of cold weather. And in Palm Beach, Florida, the temperature dropped to extreme 7 degrees Celsius for these southern places. Frozen iguanas living in the zoo there, fell from the trees. Death to the lizards is not yet threatened. They are in a state of suspended animation, but if the cold lasts more than two days, the zoo will lose its inhabitants. To the weekend residents of the east coast are waiting for even more severe cold. The US National Meteorological Service also announced a possible increase in snowfalls in several states. In some parts of New England can fall to half a meter of snow.